In process industry many chemical reactions are carried out between liquids, slurries & gases. For such process we offer a hollow agitator, which pumps gases from head space to lowest part of reaction vessel. A specially designed impeller disperses gases into reactor bottom with reasonably great force to maximum interface between gas & liquid resulting gas liquid mixing. Gas bubbles react with liquid homogenously as they rise & un-reacted gases are re-inducted into the liquid. Shree Krishna Fabricators PvtLtd., established in 1992, is in the field of manufacturing of plant and equipment for chemical and pharmaceutical industries. We manufacture equipment as per ASME, TEMA, DIN, IS Standards and cGMP equipment in compliance to USFDA, UKMCA, TGA. We have almost two decades of proven expertise in designing, manufacturing, installation, and commissioning of process plants & equipmentsWe undertake turnkey projects too. 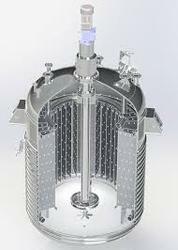 Manufacturer of storage tanks, continuous stirred-tank reactors, mixers, blenders, pressure vessels etc.